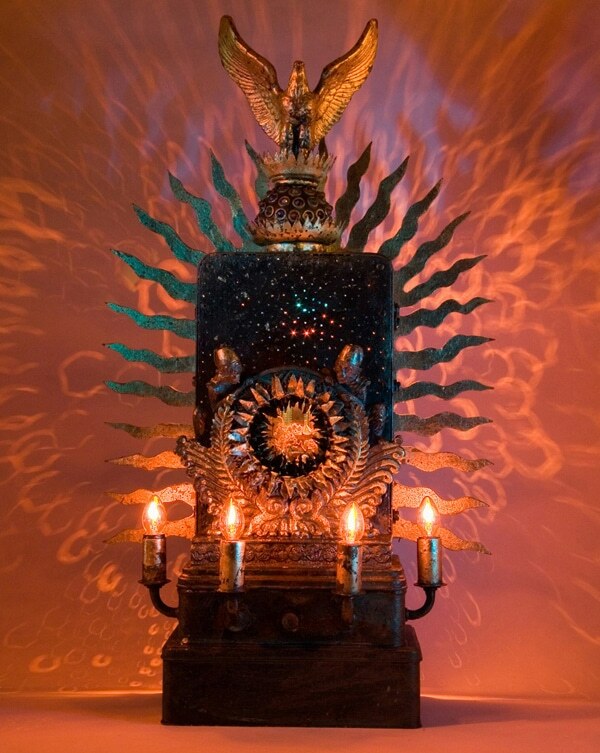 Make Mag posted an article about Mark Soppeland – Mark’s a sculpting artist who works with a lot of found objects and illumination. His works are beautiful, albeit very ecclectic. I like ecclectic, how about you? Mark Soppeland received his B. F. A. from the University of Colorado, Boulder in 1974 and his M. F. A. from Ohio State University in 1976. A painter, sculptor and designer he has shown his work in over three hundred and fifty exhibitions on four continents. He has been awarded four Ohio Arts Council Individual Artists’ Fellowships. During the summer of 2002 he spent two months in Prague, Czech Republic on an OAC International Artist in Residence Fellowship. He has created over forty-five public art projects. Mark is finished his thirty-first year of teaching last spring at the Myers School of Art at the University of Akron where he was recently promoted to the rank of Distinguished Professor. Check out Mark’s light sculpture work here. There’s a lot of light sculpture and some public works.